Review the topics on this page to familiarize yourself with the location and purpose of components in the Agent Dashboard. Tip: If you want to learn more about being a Zendesk agent, check out the agent training courses on the Zendesk Training site. The sidebar, the area down the left side of the interface, with navigation buttons to major features. The top toolbar, the area at the top of the interface, with tabs to open and move between tickets, as well as quick links to search and other apps. The main window, where most of your content is displayed. These sidebar icons navigate you to major feature areas. Your sidebar may include additional icons for apps installed by your admin. You: Open tickets that are currently assigned to you. Groups: New and open tickets that are currently assigned to one of your groups. Good: Solved good satisfaction tickets that were set to solved during the current week and are currently assigned to you. Bad: Solved bad satisfaction tickets that were set to solved during the current week and are currently assigned to you. Solved: Solved tickets that were solved during the current week and are currently assigned to you. Note: For ticket statistics, the current week is Monday to Sunday. You: Percentage of the solved good satisfaction tickets that were set to solved during the last 60 days and are currently assigned to you. Help Desk: Percentage of the solved good satisfaction tickets that were set to solved during the last 60 days in your Support account. Views: Displays your shared views and any personal views you've created, and enables you to access and worth through tickets in each space. You create views in Admin settings. Customer Lists: Displays shared customer lists (created by Admins), and enables you to create personal customer lists for your own use. Reporting: Displays the Reporting Overview, where you can view data about your ticket volume and management, updated on an hourly basis. It also enables you to compare your own ticket metrics, and against those of your fellow agents. 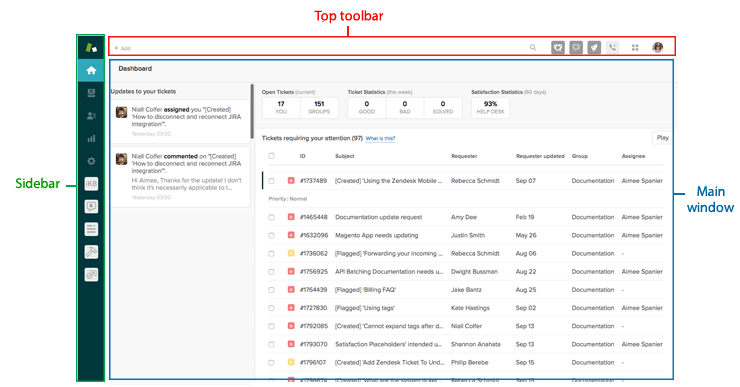 It may include other tabs, such as Insights and Satisfaction, if these options are enabled. Admin: Displays the Admin home page, where you can find the tools you need to configure Zendesk Support and view your current setup. Agents can view a version of the Admin page tailored to their permissions. Add tab Click to quickly create a new ticket, or hover and click to create a new ticket, user, organization, or search, and view your five most recently viewed tickets. Tabs: Any ticket, organization, user, or search you open appears as a tab. Click the tabs to move among these elements, or click the X to close the tab. Search: Opens a search box, and displays a link to Advanced search. 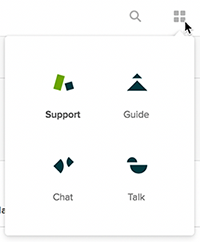 Zendesk Products: Click to display icons linking to Zendesk Support, and to available Help Centers. 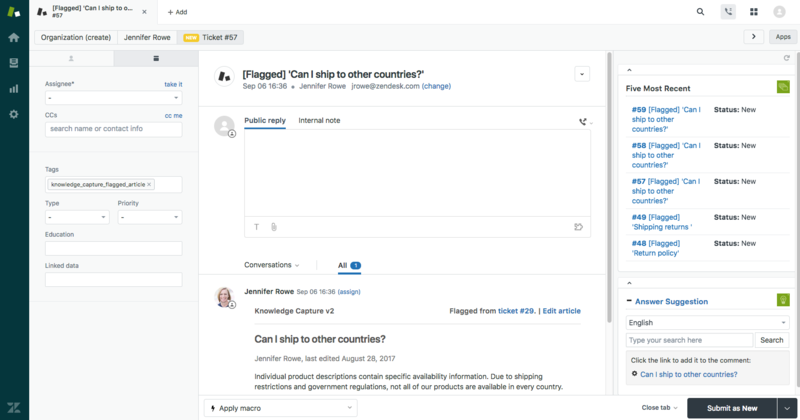 See Navigating between Zendesk Support and Help Center. Your profile: Opens a menu containing links to your profile, help, a user feedback form, and keyboard shortcuts. The main window is in the center of the agent interface. What's in it depends on which icon you have clicked in the sidebar or top bar. You're most likely to be using the ticket interface, which we'll go over in this section. Other feature interfaces may be available to you, depending on your settings and installed apps. When you click on the Home icon in the sidebar, the agent dashboard appears. From there, you can click on a ticket to open it in the main window. The information displayed on your ticket can vary, again, depending on your setup. 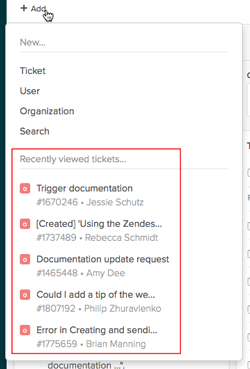 For example, administrators can use contextual workspaces to control the ticket fields, macros, and apps that appear. The sections below describe some of the more common elements you may run into. Down the left side of the window, you'll see the Properties panel. The fields displayed here contain metadata about the ticket. These fields, including their field type (drop-down, text entry, and the like) are defined on the Admin Home page. For more information on the Properties panel, see Managing your tickets. Organization is the name of the organization the ticket submitter belongs to. Clicking this label takes you to a list of all tickets submitted from this organization. User is the name of the person who submitted the ticket. Clicking this label takes you to a list of all the tickets submitted by this person. Ticket info displays the ticket status, type, and number. Next ticket scrolls you to the next ticket in your selected view. The Apps button opens a panel listing all of your available apps. Subject is the title given to the ticket. You can edit this by clicking on the subject and entering a new one. Requester is the name of the user who submitted the ticket. You can change this by clicking the change link. SLA displays any user-specific rules applied to the ticket. In the example above, tickets from this company must be solved within seven days, per the Service Level Agreement. Hovering your mouse over the rule displays the date by which the ticket must be solved. 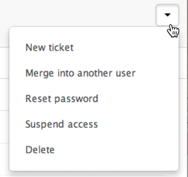 Ticket options is a drop-down menu displaying actions you can take on the ticket. Click Public reply (the default selection) so your reply is visible to anyone viewing the ticket. Click Internal note so your reply is visible only to other agents with permissions to view the ticket. Preview (optional) displays your reply as it will appear to other users, including any Markdown text formatting. For information on Markdown, see Formatting text with Markdown. Call (optional) displays options for selecting or entering a phone number to initiate a phone call with the customer. The Ticket conversation allows you to choose what information you want to view in the comment stream. 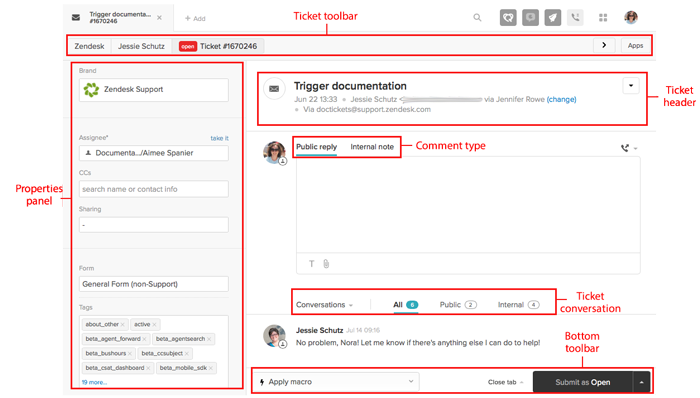 For information about comments, see Adding comments to tickets. Conversation displays only the communication between the agent and the customer, or the agent and other agents. Events displays all replies, status changes, and the like, applied to the ticket by an agent or a business rule. The number by each comment filter indicates how many events are included in that filter. 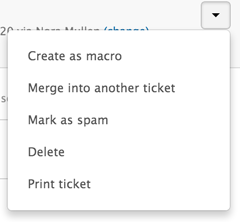 Click the Apply macro button to view and select any available macros, and apply them to the ticket. For more information on macros, see Using macros to update tickets and chat sessions. Tab action allows you to select what happens to the tab after the ticket is submitted. Click to select Close tab or Stay on ticket. Status options allows you to submit ticket updates and select the status applied to the ticket upon submission. Click to select a ticket status: Open, Pending, On-hold, or Solved, and submit the ticket. Apps enable you to customize, and enhance your Zendesk products. You can use the Zendesk Marketplace to browse, and install apps. If you have installed apps, agents can click Apps to view and interact with the apps panel on the right of the interface. To learn more about managing apps with Zendesk, see Managing your installed apps. Here are some quick tips for common agent tasks. How do I create a ticket, add a user, or add an organization? Where is my list of recent tickets? How do I search my Zendesk account? Where is the link to my Help Center? Where do I find the user options? Where do I find the tickets options? 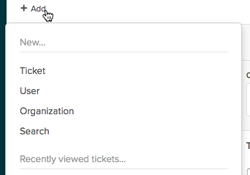 You create new tickets, add users and organizations, or start a search by hovering over the Add tab in the top toolbar. If you click the Add tab, a new ticket is created. Your list of recent tickets is under the Add tab. Your five most recently viewed tickets are displayed. When you click a ticket's title, it opens in new tab in the agent interface. Click the Search icon ( ) in the top toolbar. You can easily open your Help Center from the Support agent interface. The user actions are located on the user's profile page. Click the user name on a ticket. Click the User options menu on the upper-right side of the user's profile page, then select an option. The ticket options are located in the Ticket options menu on the upper-right side of a ticket. seit heute gibt es eine neue Ansicht,leider ist diese nicht sehr Übersichtlich, da kein Kontrast. Die Hintergrund-Farbe der Seitenleiste mit den Symbolen anpassen. Hilft es Ihnen hier weiter, eine andere Hintergrund-Farbe zu verwenden ? This is a great article that I continue to reference to new agents of our Zendesk Instance! One of our agents noticed that if they use a Macro that updates the ticket status, the status on the Ticket info will update to that given status from the macro even though they have not yet submitted the ticket. For example, if I have an open ticket and apply a macro to set the ticket to solved, it will update the Ticket info status to Solved, even though you haven't submitted the ticket. The ticket is in a sort of limbo where technically it is open because I have not yet hit submit but I can tell that the Ticket info is just directly updating based on the bottom toolbar status. I am curious on your thoughts on this and based on the scenario above, would it make sense that the Ticket info were to reflect open until it was submitted? Of course this would require to go back into the ticket to see. Please reach out if you have any questions. Can I customize the dashboard, or replace it with a view I've created? Not at this time, but additional functionality around the Agent Interface has been proposed for next year.